Don't be a "Wasteful Wendy"
Cool the Earth is an organization that reaches into elementary school classrooms and Girl Scout troops all over the country, and they’re working to make saving energy and being good stewards of our natural resources fun. Participating schools are given a packet of materials to kick off the program with an all school assembly, where characters like Koda the polar bear, Earth, Mother Nature, and Mr. Carbon (boo! hiss!) introduce the topic of global warming and how human actions contribute to the problem. The kids are inspired to save Koda’s icy homeland by getting rid of the villain Mr. Carbon. Monthly highlights focus on a particular action, and an Action Banner tracks the progress of the whole school, charting the amount of energy saved and the amount of greenhouse gases avoided. 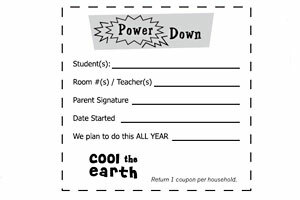 School teachers can go online to access materials, get advice from the staff of Cool the Earth, or just brag about how their school is doing. The program is working because it employs an age-old motivational strategy– get to the parents through their kids. And the results are tangible. The program so far can account for more than 25 million pounds of carbon emissions avoided. There are 149 schools involved in the program so far, and there is a waiting list for participation. Almost 23,000 students are involved– translating into many more thousands of parents, brothers, and sisters.